A view of the "Great Gallery" during the 2016 Pathfinder Awards banquet. During the last year Amazon founder Jeff Bezos has begun to open up about the scale of his ambitions with the rocket company, Blue Origin, explaining that he envisions millions of people living and working in space. Additionally, Bezos has talked about moving heavy industry off of planet Earth to create a garden paradise on our home planet. In this view Bezos' philosophy differs significantly from the other titan of the new space industry, Elon Musk of SpaceX. Both men agree that reusable spaceflight is essential to lowering the cost of access to space, but they disagree about what to do once we get there. Musk has spoken openly of providing humanity with a "backup plan," and recently revealed his ultra-ambitious plans to colonize Mars with 100 passengers at a time via his Interplanetary Transport System. 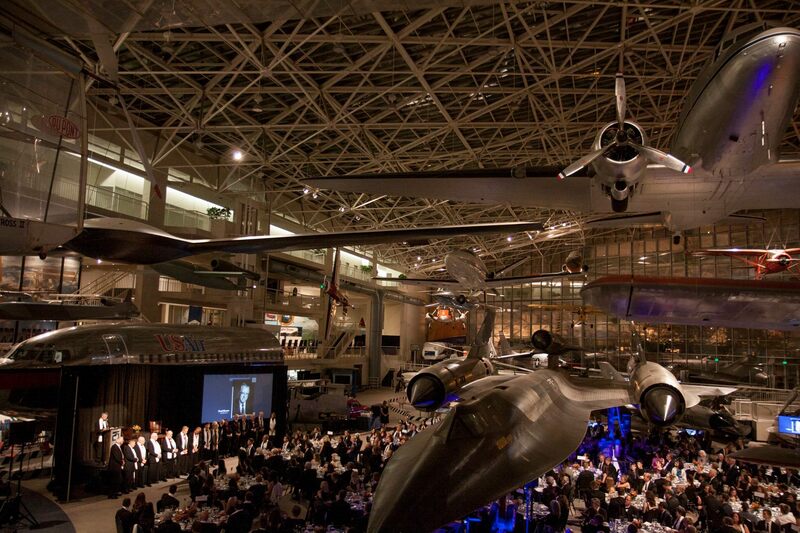 Bezos dismissed this approach on Oct. 22, during the Pathfinder Awards at the Seattle Museum of Flight. In remarks first shared by GeekWire, Bezos said Earth should be zoned as a residential area. "I don't like the Plan B idea that we want to go into space so we have a backup planet," he said, noting NASA's efforts to send probes throughout the solar system. "Believe me, this is the best planet. There is no doubt this is the one you want to protect. This is the jewel. We evolved here, we're kind of made for this planet. It's gorgeous, and we can use space to protect it." Humanity has two futures, Bezos said. It can continue to grow, or it can settle into some kind of population equilibrium. As an example of the planet's limitations he offered energy as an example. Taking the baseline energy use on Earth, and compounding it at 3 percent for 500 years, would require covering the entire surface of the Earth in solar cells to meet the demand by the year 2500. "We need to go into space if we want grow as a species," he said. "Another route would be just to face stasis, but I don't think that's as interesting. I don't think we want to just survive on this planet, I think we want to thrive and do amazing things." With his reusable approach to lowering the cost of spaceflight, Bezos said Blue Origin will try to provide the infrastructure needed to enable humans to do interesting things in space. Bezos said he believes that if he can provide low-cost access to space, the next generation will figure out how to creatively use zero gravity, 24/7 solar power, as well as valuable resources on the Moon and asteroids. "With the internet two kids in a dorm room with a good idea can change the world," he said. "That's really hard to do in the space business because the price of admission is so high." So the founder of Amazon, who took advantage of existing infrastructure to dominate online shopping, believes that his job now is to enable the future Amazons of space.